I’m fascinated by the world of extreme sports. Not just by the athletes and their adventures, but also by the brands that help to power them. The heli-skiing companies. The obstacle race providers. The gear and apparel companies. And in this case, Honey Badger, an all-natural energy supplement drink. I’ve been in touch with the folks at Honey Badger for a while now. I’ve seen their recent website launch and have had the chance to chat with them on the phone. I’ll be honest – these guys seem fun. They have a really cool product, different than what you might initially think, and they’re poised to do some pretty big things in the extreme sports community. I fired some questions at Luke Cote, Honey Badger’s Director of Sales & Marketing, to learn more. Our mission is to become the best supplement company in the industry. We have a game-changing concept that needs to be introduced into this ever-evolving market. Artificial sweeteners must go; sugar needs to be used in moderation and from natural sources. We feel we can help make an impact on people’s lives as well as have fun doing it. We intend to lead the charge in positive change within the industry. We also want to help grow our charity partner The Mark Forester Foundation. Mark was a roommate and best friend of Robert in the Air Force. All proceeds from our Liberty Bottles go straight to the MFF. We feel very strongly about the organization, as it is personally connected to us. How did Honey Badger get off the ground? He enjoys living an active and health-conscious lifestyle. He worked long hours with his job in Nuclear Power and had trouble finding the energy to get in productive workouts. He started using PREWORKOUT Supplements and was hooked. After using several different brands he noticed that there were some issues with the formulas. It did not meet his criteria, and he thought that he could do better. He envisioned a PREWORKOUT that fit his personal preference and figured others would follow suit. The criteria consisted of being as natural and clean as possible, no fluff ingredients, and no sugar. Each ingredient had to be absolutely essential to the entire blend or it wouldn’t be added. After finagling with many formulas, many trial and error runs, on family and friends, he eventually created the premise of a formula. Excited with the results he called upon his most trusted allies; his Brother’s, to help form a company to develop this formula further. Then, came the most important question, what do we name this exciting new formula? There were so many names being tossed around. Nothing would stick. We knew the name had to bold and stick out in a very crowded market. The story begins with a uniquely fierce animal, which symbolizes everything our company represents. This animal demonstrates characteristics of fearlessness, determination, and resiliency. It can fend off deadly venomous snakes, predators twice its size and endure hundreds of bee stings, stopping at nothing to snack on its favorite foods. It’s lean and mean, resilient, full of energy and never stops moving forward. The fearless attitude and prominent characteristics are what caught our attention and proved a perfect fit in naming both the company and product line, HONEY BADGER. We secured the rights to the name of our category of products and the rest is history. The Company was Founded October 1, 2011. After a little over a year in development our first product was launched in December 2012. And you have sponsored athletes? Many sponsorship opportunities are popping up all over the place as we have a product that can be used by many athletes. We are looking at sponsorship opportunities, but since we are a small brand still, we have to focus on building the company first. We have several segments of business, which we have started to separate and focus on individually. How did you find these athletes? Claire Hewitt-Demeyer was the first athlete to embrace Honey Badger. We had sent our friend Mad Max a few jars of Honey Badger. He let Claire try it and she was hooked. He put her in touch with us and the rest was history. Darrell “The Mongoose” Montague is an up-and-coming flyweight MMA fighter. This young man has tremendous potential and upside as he shows quickness and explosiveness. He recently won a big fight. He has a great manager, Steve Lara, CEO of WSMFights.com, doing his best to help get him into the UFC as he deserves a shot to fight the best. Adam Schindler is a friend of Ryan Bonello, Co-Founder of Honey Badger. Ryan was in Thailand, training in one of his passionate styles of fighting, Muay Thai. During his time at a training camp, he met Adam Schindler. They immediately became friends and stayed in touch as they both are from the US. Adam Schindler has been in the MMA scene for several years and had some major fights in the Bellator franchise. He suffered an unfortunate knee injury that set up back a while. He just had his return to the octagon recently and suffered another knee injury. This guy shows the true heart of a Fighter. His future in MMA is uncertain. But he’s a friend to us and we support him either way. How are you different than other energy drink and supplement companies? Our product is more than an energy drink. It’s a hybrid of performance and energy. The benefits of our synergistic blend can help with energy, endurance, focus, intensity, hydration, and recovery. We are marketing it as the ultimate PRE meaning it can be used PREWORKOUT, PREGAME, PREACTIVITY. We purposely designed it to be open-ended for use, and not isolated for one function. The versatility is what makes it unique as it can be used for many applications such as lifting, running, biking, dancing, driving, and gaming to name a few. It is very versatile. Our flavoring system is what sets us apart from the rest of the pack. 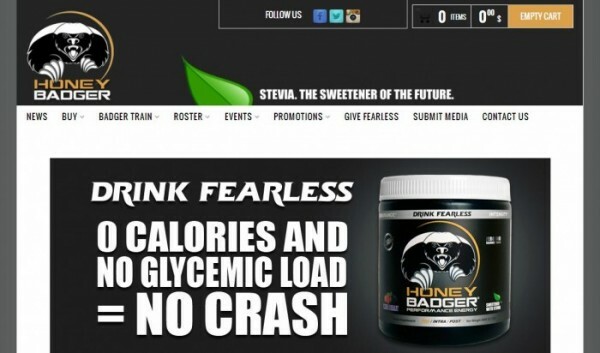 No other comparable formula contains Stevia as the only sweetener. We’re breaking the mold of what everyone else is doing. Each ingredient in our formula has to be essential and serve a purpose. You can literally feel our formula working and quickly. We cut out all the fluff and it shows in the results. What I mean by fluff are filler type ingredients. We refuse to use ingredients that are beyond artificial and pose health risks. We will not compromise the health of our customers. We make products that we use ourselves. No marketing hype with Honey Badger, just pure, proven ingredients, in their superior forms for everyone to see. All the ingredients are sourced from reputable companies with proven track records of providing safe and pure ingredients. All ingredients are analyzed at the manufacturing facility to test for purity. We do not use proprietary blends. We list all the active ingredient amounts for all to see. We say, “active ingredients, because we do not disclose the amounts of the other ingredients in the supplement facts.” We feel it’s important to be as transparent as possible. Our approach and interaction with the customer is different. We are breaking the mold of traditional corporate models. We connect on a personal level with each and every customer. We try to go above and beyond for everyone. Building real relationships with real customers goes a long way. Social media allows us to instantly connect with people. We also use it to provide customer service by responding to people where they’re spending most of their time. Take a look at our Twitter feed @HoneyBadgerBev and you’ll get an idea of what’s going on with Honey Badger. We are actively pursuing several sports. We like to call it the Three-Headed Monster. It’s Obstacle Racing, CrossFit, and MMA. All three are the fastest-growing sports out there. Our main focus is sponsoring Spartan Races beginning fall 2013 (Sacramento, Malibu, Fenway Park Boston, Austin). We feel Obstacle Racing is the least saturated within our product offering, and we have a huge opportunity to cement our brand within the sport. The Spartan Race presents one of the most challenging Obstacle Racing courses out there. The Honey Badger brand fits well with the rugged sport of Obstacle Racing. Some other Events we will be sponsoring and attending are a few big supplement events such as the Olympia and Arnold Classic, as well as an up and coming CrossFit league based out of Atlanta (AAL – Atlanta Affiliate League – Championship Series 6/29/13). One of our other very promising markets to pursue is the gaming industry, as we have recently generated significant interest from some reputable gamers who contacted us directly. This has led to a test marketing phase and so far we’ve begun to make some noise. Since a large audience within that market is teenagers, we’re confident their superiors/ parents would approve of our all natural, health conscious products over other brands, who take less of this into consideration. Right now our company culture is very family-oriented. We are aggressive, young, relentless, and get things done. The three founding members are all brothers. They’re very competitive amongst each other. Put them together and they synergistically work. Each team member brings value to the table and strives to succeed. At the end of the day it’s all about the customer! We truly stand by that, 150,000%! Luke, thanks for taking the time to answer some questions about your company. The Nerve Rush community looks forward to your growth! Check out their company here: drinkhoneybadger.com.